May 4, 2016 -- Links International Journal of Socialist Renewal -- Despite some flaws, this book is a good introduction to the Syrian revolution. It explains why people protested against the Assad regime, and why many of them took up arms. It also shows how the initially non-sectarian popular uprising was increasingly converted into a sectarian conflict. The main flaws of the book relate to the role of Turkey, and of the PYD (Democratic Union Party) in the struggle in Rojava (the predominantly Kurdish area in northern Syria). I will return to these points later. The book begins with a brief history of Syria. When the Ottoman empire was divided up among the victorious powers after World War I, Syria was given to France. There were several rebellions against French rule in subsequent decades. Syria gained formal independence in 1946. 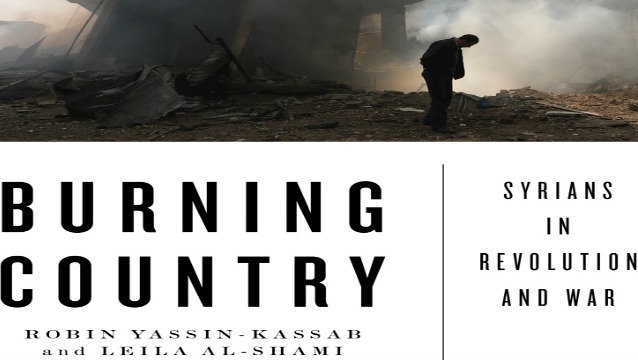 The book briefly outlines the complex political struggles in post-independence Syria. The rise of Arab nationalism throughout the Middle East affected Syria too. Egyptian leader Gamal Abdel Nasser's nationalisation of the Suez canal in 1956 inspired great enthusiasm in Syria, and led to a short-lived unification between between Syria and Egypt (1958-61). The United Arab Republic (UAR) government redistributed some land to peasants and offered social provision to the poor. However it repealed the right to strike and banned independent trade unions and political parties. The repressive and Egyptian-dominated nature of the UAR regime alienated many Syrians, giving right-wing forces an opportunity to carry out a military coup and end the union. The Baath Party was one of the main Arab nationalist forces in Syria. In 1963, military officers belonging to the party carried out a coup. After further struggles within the Baath Party, Salah Jadid emerged as leader. His regime was radical in its economic policies, carrying out the nationalisation of industry and agrarian reform. But according to the authors, this was a "top down revolution" [p. 10]. Jadid was also radical in his international policies, talking of a "people's war" to liberate Palestine. However there was no real preparation for waging such a war. When war broke out between Israel and several Arab states in 1967, Israel won a quick victory, and took control of Syria's Golan Heights, which it continues to occupy today. A coup within the Baath Party in 1970 brought Hafez al-Assad to power, replacing Salah Jadid who was jailed for life. Assad pursued a more conservative policy, both domestically and internationally. He reached an accommodation with the Gulf regimes, obtaining aid and investment from them. He also reached an accommodation with the Syrian bourgeoisie and the Sunni clerics. He purged leftists from the Baath Party and the army. He pursued "more liberal economic policies which benefited some families from the old mercantile elite as well as parasitic new entrants" [p. 12]. The result was the growth of a "crony capitalist elite" which was "wealthier than the bourgeoisie of the pre-Baathist era" [p. 13]. In 1976, Assad sent the Syrian army into Lebanon, preventing a victory by leftist and Palestinian forces in the civil war and then slaughtering Palestinians in the camps. When leftists were purged from the army and party, they were replaced by people loyal to Assad, who were mainly from the Alawi sect, to which Assad belonged. This gave the regime a sectarian aspect, with the top levels of the army and party being predominantly Alawi. The Assad regime was highly repressive. Political prisoners were tortured. A "facade of pluralism" was provided by the National Progressive Front, comprising of the Baath Party and nine smaller parties that accepted the Baath's leadership. One of these was the Communist Party. But in reality, "Syria's was a one-party system and the party was controlled by one man". The authors argue that Assad's Syria was "fascist....It sought to replace class conflict with devotion to the absolute state" [p. 14]. When Hafez al-Assad died in June 2000, his son Bashar took over. Initially, there was some hope that things would change. Calls for an end to martial law and freedom for political prisoners were initially tolerated. Some prisoners were freed. But in 2001 there was a new crackdown. Some of those who had spoken out the previous year were arrested. One of them was Riad al-Turk, secretary-general of the Syrian Communist Party (Political Bureau), a group which had split from the Communist Party after the latter joined the National Progressive Front. Bashar carried out neoliberal economic policies, including the privatisation of key industries, and cuts to subsidies for food and fuel. Inequality grew, as did unemployment. Youth unemployment was 48% [p. 29]. Foreign investment flooded in, especially from the Gulf. Assad used "anti-Western and anti-Zionist rhetoric". At times he opposed US policies, such as the 2003 invasion of Iraq. But according to the authors: "On closer examination the regime's vocal anti-imperialism was no more than populist opportunism. Bashaar had no qualms about colluding with the US-led 'war on terror'; Syria was a popular destination for terror suspects illegally extradited by the US to third countries for 'torture by proxy'" [p. 25]. In 2004 there was a wave of protests and riots in Kurdish areas of Syria. This spontaneous uprising followed a massacre of 36 people, mainly Kurds, in the town of Qamishlo. Regime symbols were attacked, police stations, courts and Baath Party buildings set alight. Repression was severe. According to the authors, "More than 2,000 Kurds were detained, often without charge. Many were tortured in prison, including children as young as 12. Five detainees died" [p. 23]. The Kurds had long been discriminated against. In 1962, 120,000 of them were deprived of Syrian citizenship. There was a ban on Kurdish publications and cultural festivals, and on the use of Kurdish as a language of instruction in schools. In early 2011 a wave of protest spread through much of the Arab world. Dictatorships were overthrown in Tunisia and Egypt. These events inspired similar protests in Syria. On March 6, fifteen schoolboys were arrested in the city of Deraa for painting revolutionary slogans on walls. They were tortured in detention. On March 18 there was a protest demanding their release. Government forces fired on the crowd, killing four people [p. 38]. From then on the violence escalated. Early protests were non-sectarian. A participant in a demonstration in Homs on April 18 reported that “all [religious] sects were present” [p. 43]. This protest was attacked by the army, killing many people. In response to such repression, some protestors took up arms. Some soldiers refused to fire on protestors, and deserted to set up or join rebel groups. Thus the uprising turned from a peaceful protest movement to an armed rebellion. The revolution was not led by a vanguard party or any centralized organisation. According to the authors, there were “a plethora of initiatives that emerged organically … In the revolution’s first weeks, coordination committees … sprang up in neighbourhoods, villages and towns across the country” [p. 57]. These committees helped organise resistance in local communities. “They focused on street action, preparing slogans and banners for demonstrations, barricading areas to protect protestors, and documenting events which they uploaded on social media. Over time their focus would turn to setting up makeshift field hospitals and collecting and distributing food and medical supplies to besieged and bombarded communities” [p. 58]. In some areas, when Assad regime troops withdrew, elections were held for local councils. However the regime’s repression took its toll on non-violent activists. “Tens of thousands of civil revolutionaries were disappearing into Assad’s dungeons. As the revolution militarised, the vibrant popular movement gradually lost its prominence” [p. 76]. Many activists were reluctant to take up arms. But, as the authors say: “Violence has its own momentum. When residential areas are subjected to military attack, when neighbourhoods experience the horror of children tortured to death, when young men are randomly rounded up and beaten, soon they will respond” [p. 79]. The armed rebels were referred to as the “Free Syrian Army”. But the authors say that the FSA “was never an army but a collection of militias” [p. 85]. There was “a cacophony of a thousand competing leaders” [p. 78]. One source of disunity was the competition between different rebel groups for funding and arms from external sources, particularly from governments and private individuals in the Gulf. For example, there were “conflicts … between Qatari- and Saudi-funded officers” [p. 87]. The Assad regime escalated its violence. Rebel-controlled towns and suburbs were besieged and bombarded. The escalating violence was accompanied by the growth of religious sectarianism. According to the authors, this was “deliberately provoked and manipulated, by a host of secondary actors but primarily by the regime” [p. 110]. The regime targeted Sunni areas for collective punishment, in the form of aerial bombardment, prolonged sieges or massacres carried out by Alawi and Shia militia units. Such massacres created a “thirst for revenge” amongst Sunnis. In addition the regime’s increasing reliance on Lebanon’s Hizbullah and other Iranian-backed Shia militias gave the conflict a “Sunni-Shia flavour” [p. 112]. The “secondary actors” promoting sectarianism included some donors in the Gulf states. “With the FSA hierarchy unable to establish a consistent weapons supply, the fighting brigades had to organise their own networks of support. The most easily tapped sources were Salafist fundraisers and businessmen in the Gulf. In their nomenclature and (filmed) symbology, therefore, resistance militias increasingly appealed to this audience” [p. 121-2]. Gulf governments also played a role: “Saudi Arabia funded militias led by men with tribal or personal connections to the Kingdom, and some of these were Islamist … Qatar, in tune with its regional pro-Muslim Brotherhood policy, armed Muslim Brotherhood-linked as well as Salafist groups. In addition, the airtime given by Gulf TV channels to Islamist and Salafist anti-Assad activists may have been as influential on the ground as Gulf money” [p. 122]. One result of the promotion of sectarianism by both the Assad regime and the Gulf states was that most Alawis and other religious minorities remained loyal to the regime. Those who did not were ruthlessly repressed. Meanwhile there was a growth of Sunni-sectarian rebel organisations. The Assad regime contributed to this by freeing 1500 Salafists from prison, some of whom went on to become leaders of the Army of Islam, Ahrar al-Sham, Jabhat al-Nusra and ISIS. These groups try to impose a religious dictatorship in the areas they control. At times this has led to protests, sometimes successful, by the local people. The authors lament the lack of solidarity with the Syrian revolution from the Western left. Sections of the left have supported Assad: “Some Western sympathy is generated for the Assad regime by the sense that it – alongside Iran and Russia – stands in opposition to hegemonic US imperialism … A closer examination of the regime’s neoliberal policies and security collaboration with the West … soon demolishes the foundations on which this reading is built. Yet it persists” [p. 212-3]. The authors describe this “two-campist method of thought” as “an archaic legacy of the Cold War” [p. 213]. Russia has sent billions of dollars worth of arms and ammunition to the Assad regime. The authors point out that Russian-supplied equipment has been used in attacks on civilians: “Barrel bombs were dropped on residential tenements, for instance, from Russian-supplied helicopters” [p. 201]. In September 2015, the Russian air force itself began bombing rebel held areas of Syria. Russia has also supported the Assad regime at the United Nations. The authors view Russia, like the US, as imperialist, and say that “Russia – providing weapons, deflecting sanctions, shielding from blame – is to Syria what the United States is to Israel” [p. 213]. While the authors are right to denounce Russia’s role in supporting the Assad regime, they are wrong to deny Turkey’s reactionary role in Syria. They say: “Conspiracy theories of outright Turkish collusion with ISIS, meanwhile, are unfounded” [p. 203]. The Turkish state also influences other rebel groups, to which it gives weapons and supplies, to attack areas controlled by the PYD and its allies. According to the Kurdish Question website, “138 people have been killed in attacks on Aleppo’s Sheikh Maqsoud neighbourhood in the past seven months”. [b] Sheikh Maqsoud is a predominantly Kurdish area controlled by the PYD. The authors recognise that an "inspiring social revolution" is happening in Rojava [p. 73]. But they claim that "In the Kurdish regions, the revolutionary process was more top-down and party-led than elsewhere" [p.74]. This implies that there is a contradiction between leadership by a revolutionary party and democratic control from below. I disagree with this assumption. In my view the existence of a revolutionary party (the PYD) is an advantage, not a problem. The PYD has encouraged the formation of democratic institutions. The authors recognise some of the achievements of the revolution: "In each canton, councils and public institutions have been established through direct elections. These include the administrative structures dealing with security, service provision and justice. All are linked up in a decentralised confederation. Through local communes, people also self-manage areas such as health, education, environmental protection and food supply, discuss community problems, and mediate to resolve disputes before they go to court. Workers cooperatives have also been set up. The region's minority ethnicities - Arabs, Yezidis and Assyrians - are included in these grassroots forums, and 40 percent of commune and council members are women" [p.73]. But they claim that the PYD, which has led this revolution, "remains a highly centralised and authoritarian party" [p. 74]. They cite various alleged acts of repression by the PYD, but fail to put these in context. Rojava is a society under siege from all sides. It has been attacked militarily by Turkey, ISIS, Jabhat al-Nusra, Ahrar al-Sham and some other rebel groups. Iraq's Kurdistan Regional Government (KRG) is also hostile to the PYD and has repeatedly banned trade and travel between Iraqi Kurdistan and Rojava. Given this context, it would be unrealistic to expect Rojava to be a model of unrestricted political freedom. Nevertheless, Rojava has made great progress in democracy and human rights. The authors note that Rojava's Social Contract (constitution) "promotes unity and coexistence among the region's diverse ethnic and religious groups" [p. 73]. Yet they claim that "PYD leader Salih Muslim has ... called for the expulsion of Arabs from the region" [p.74]. Militarily, the predominantly Kurdish YPG is allied with Arab, Turkomen and other fighters in an alliance called the Syrian Democratic Forces. Thus the unsourced claim that Salih Muslim called for the expulsion of Arabs is in contradiction with his own words, publicly stated on many occasions, and also with the actions of the PYD. Why then did the authors make this claim? I suspect they were misinformed by Kurdish opponents of the PYD. The book cites several such critics, at least one of whom is a supporter of the Kurdish National Council, a group supported by the KRG [see p. 74-75]. Given the misinformation about Salih Muslim's alleged statement, the other accusations against the PYG should also be treated with caution.